An adventurous group of divers made their way to Bali in October for what would turn out to be a trip filled with excitement. After touring Bali for a few days we boarded a flight to Maumere In the Flores region of Indonesia. We boarded the luxurious Arenui, our home for the next 11 nights. The Arenui is what they call a boutique liveaboard, mainly because of the beautiful design of the boat and the attention to detail of the decor on board. There are 8 staterooms allowing for 16 guests, and 22 crew members to take care of those guests. We had 15 in our group and we were well taken care of. The cruise directors, Jerry & Debbie were fantastic, the divemasters, Wawan, Ronald and Ungke were rock stars and the rest of the crew were incredible. From the delicious meals to the luxurious accommodations to the attentive crew, we were pampered from start to finish. The diving was unique as well. 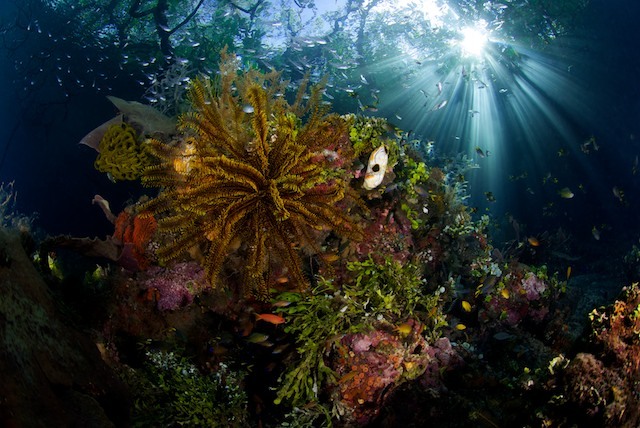 We say large schools of fish, Anemone covered reefs, pristine coral and plenty of wonderful little critters. On one of our night dives we saw over 20 octopus with 6 in the first 2 minutes of the dive as well as two long arm octos mating. We also saw the beautiful bubble shell that most of us had never seen before. 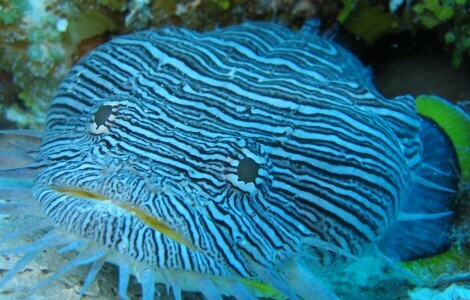 One of the most famous critters found in Alor is the rhinopious, a member of the scorpion fish family. 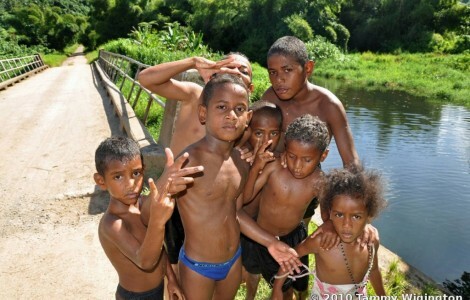 They are very rare in other parts of the world but fairly common in Alor. We saw 9 of them. We also saw a wobbegong shark and several mototi octopus as well as a couple of pairs of mating nudibranch. One of the highlights of the trip was a special trip we made to an Island called Komba. This is an island off of any nautical chart that is a live volcano. We were told by the crew that it can be a rough trip to get there and that we would have a long cruise from there to our next destination. So, we would not be able to stay very long, the attraction was that the volcano erupts every 15 to 20 minutes. We were all very excited to see this natural phenomenon so off we went. When we arrived we found flat calm seas and this unbelievable spectacle that none of us expected. It was still daylight, we could see billows of smoke shooting out of the volcano and a few sparks of fire. 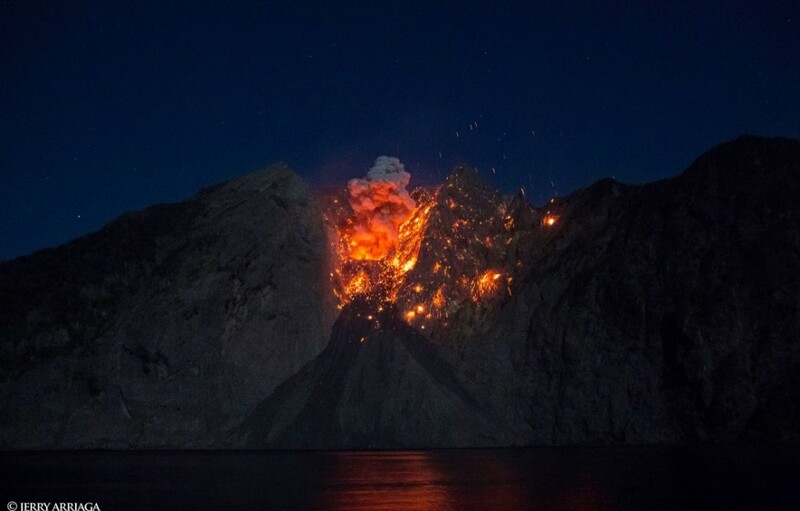 As night fell the show began, with a full orange moon behind us and calm seas under the boat we watched as fire shot into the air and fiery rocks rolled down the mountain just 100 yards in front of our boat. At first everyone watched in silence, we could fell the booming eruptions in our bones. After a while we all roared with excitement each time it happened, which by the way was every 15 to 20 minutes as promised. The captain graciously allowed us to stay and have dinner on the top deck of the Arenui, with the calm seas we didn’t have to leave as soon as they previously warned. A truly unique vacation filled with once-in-a-lifetime experiences.